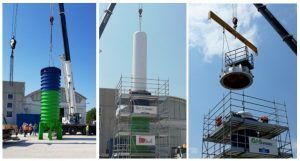 An important step has been reached in the construction of the prototyping line of the pressure cylinder. Over the course of the summer, the first hydroforming tests of the liner, the inner core of the cylinder, have taken place. A preliminary analysis of the data delivered important results for further construction of the prototyping line. Hydroforming mould plant completion and installation. The hydroforming mould, which gives the liner its final shape, is an assembly of three cylindrical welded sections, and a bottom part and flanged cover in the shape of a pointed arch. The cover can be disassembled for the insertion of the liner (Fig. 1) into the hydroforming mould. The hydroforming mould has been installed on a concrete platform outside the workshop to allow an easy introduction of the liner (Fig. 2), while the hydraulic pump package for testing was installed inside the workshop. Figure 1. The first liner during the “dot marking” stage. A very precise 100x100mm-mesh of dots is painted on the liner to follow the deformation after the hydroforming process. Fifteen laser sensors measure the expansion that occur on the walls of the liner during the hydroforming process in real time. GASVESSEL partner CNGV developed dedicated software to measure pressure and distance during the hydroforming test. At the end of July BMPlus has completed the hydroforming mould plant and the preparation of the liner for the hydroforming test. Hydroforming has been a well-established technology since the fifties. Originally, inventor Milton Garvin patented it for the production of faucets. Later, the technology was successful in different applications, especially in the automotive industry and generally in mechanics, thanks to its efficiency and economy in shaping malleable metals such as aluminium, brass and some types of stainless steel. Especially, in the case of stainless austenitic steels, hydroforming allows to significantly increase mechanical characteristics without heat treatment and with the least environmental impact. In the GASVESSEL project, the hydroforming technology is used to shape the liner, the gas-impermeable inner core of the cylinder. The liner is inserted into the hydroforming mould and filled with water. A special hydraulic circuit puts it under pressure until sufficient pressure is reached to permanently deform it and the liner is pushed against the hydroforming mould walls. With this technique, the liner obtains the internal dimensions of the mould, in terms of geometric shape, thickness and mechanical characteristics. This process gives the best results if the base material is an austenitic stainless steel and in particular an AISI 304 or 301. Two hydroforming tests were carried out on the same liner, under the coordination of CNGV. During the first test, BMPlus put the liner under pressure gradually and verified that the sensors measured the distances well. The maximum pressure reached was around 24 bar and the permanent deformation recorded was about 63 mm in diameter of the cylindrical body. The aim of the second test was to reach the maximum possible deformations on the liner. At a pressure of around 30 bar, the liner collapsed in the area considered most critical: the joint between the cover and the cylindrical body. 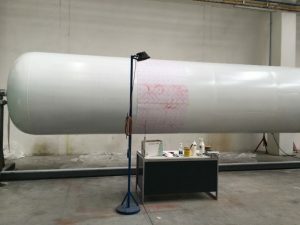 The maximum deformation measured on the cylindrical body was 128.6 mm in addition to the deformation achieved during the first test. This leads to a total deformation on the central diameter of the cylindrical body of 194.6 mm (11.2%). Overall, the test was positive and provided the first useful data for verifying the theory. More complete data for further studies will be obtained from the mechanical and metallographic tests that are currently being conducted. One of the intended purposes, namely the levelling of the welds and the perfect circularity of the liner has been achieved. This is very important for the subsequent winding of the liner with the composite material, as it avoids the phenomenon of local elastic instability, which could drastically reduce the useful life of the cylinder.